COOK: Join us in Havana for a week of cooking delicious meals where the local men and women are masters of their art…food! They will captivate you with their traditional skills and story telling in the kitchen. Our teachers use time honored recipes that were handed down from generations. This is the way Cuban men and women have cooked for centuries. It's nothing short of magical to see the kitchen come alive with available ingredients and unique personalities! EAT: After sharing time in the kitchen with new friends and your new skills we get to eat. We will sit around the table, patios, paladars and sometimes in the kitchen to share the fruits, or peppers of our labor. We will dine on fried plantains, grilled lobster, seafood stew, roasted pork, fresh fruits and much more! And of course no meal is complete in Havana without a cold Cuban beer or a traditional Mojito! We will also visit the areas food markets and dine at local paladars and newly opened restaurants each day. DISCOVER: One of the major parts of out visit is discovering and learning from the locals about the rich Cuban heritage and culture. We will walk the streets of Old Havana, take a tour of Revolution Square, hop in a CoCo Taxi for a trip around the city to see the historic sights, meet the people of Havana with home visits, tour historic HersheyTown, and stop for fresh crackers and peanut cream, and even roll a cigar on a Tobacco Plantation. We will visit sights and meet people that Americans have not seen, or visited since 1959. See the mansions of yesteryear and take a long walk on The Malacon’ to listen to the waves crash on the old stone wall. Havana is no longer frozen in time--at least not completely. Classic American cars share the city with new and inventive offerings in food, culture, and hospitality. Conquistador Diego Velázquez de Cuéllar founded San Cristóbal de la Habana in 1514 where it served as a base for expeditions of exploration of other lands. Much of this heritage has been preserved and is waiting to be explored. Old Havana (where we live for the week) is a UNESCO world heritage site where vintage cars, historic forts, museums, and beautifully restored architectural gems share the same history as the modern city. While many historic buildings are museums, others are filled with art galleries and restaurants, or are private homes, with windows open and laundry drying in the breeze. The scents of grilled meats, baked plantains, and beans and rice fill the streets, mingling with the smell of cigar smoke wafting through the plazas. Havana is a mix of past and present, freedom and restriction. It’s a city of architectural decay, but also creativity. It’s a city where finding ingredients for a great menu requires feats of strength, knowing the "right" person, and lots of ingenuity and where the Internet is just arriving. Officially, some limits for Americans remain in place. Despite recently restored relations with Cuba, tourism is still banned by the embargo. But, for those who reach Havana under the 12 categories of legal travel (which you will do when touring with us), and the rest of the world, Havana is ready. 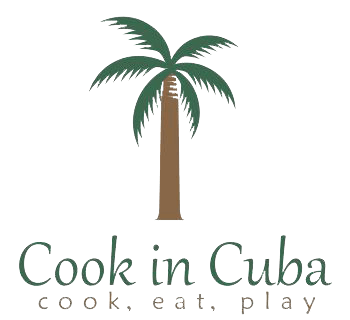 Cook In Cuba ® (US Registered Trademark) is a US registered business based in, and operating solely from the United States.